Written by Bradley Laird. Note: Click on the Preview Button to view the contents and sample pages. Learn to improvise on the mandolin! Understand the important concepts, basic music theory, use of the major scale, use of the pentatonic scale, how to navigate the fingerboard using "triangulation", how to use the Circle of 5ths, how to use the "number system" for chord progressions, how to construct scales and chords, how to practice effectively and how to decide "what to play." Theory section has 6 self-tests (with answers) to be sure you understand the material. Written in an easy to understand conversational style. Oriented towards bluegrass but useful for all mandolin styles. The 11 included MP3 Audio Tracks contain chord backup tracks for practicing what you learn, "test driving" your improvisation over various chord progressions, ear training exercises, and even a multi-speed metronome. 65 pages of information, charts, tables, and exercises. All exercises and examples are written in tablature. No standard music notation reading required. 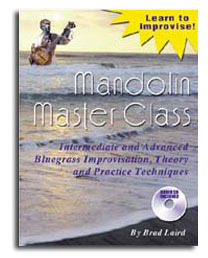 This book has helped thousands of mandolin players since I wrote it in 2006.